If we combine all Sinkers/Two-Seamers last year, Marcus Stroman located the pitch at an elite level. He was almost .40 standard deviations better than the mean (82 out of 264) when locating the pitch on the horizontal edge. On the bottom edge: he was 9th overall — 1.83 standard deviations better than the mean. The benefit outweighs the cost, but the cost is strikeout potential. His Sinker is almost a half standard deviation worse than the average from a whiff/swing perspective. However, it induces grounders over 1.4 standard deviations from the mean GB/BIP rate. Still, the lack of elite K% potential might be some of the reason he didn’t break into the top 25 Starting Pitchers in RotoGraphs 2015 Positional Rankings. I personally ranked him 23rd overall. Jeff Zimmerman ranked him 20th overall. For context, I put him just behind Jeff Samardzija and Hisashi Iwakuma and just ahead of James Shields and Julio Teheran. Hitters should be more aware of Stroman’s approach heading into 2015, but he still has an extensive arsenal with three pitches (Change, Slider and Curve) that might sum up to an average whiff/swing rate, but still ensure whiffs around 30% of the time. In all, Stroman’s arsenal score wound up 70th overall, but with the potential for more. If we take a cluster of pitchers within .5% of Stroman’s K-rate (squared above), we see that the group averages a 9.4% swinging-strike rate. Stroman was only at 8.3% last year. I do not think of this as a possible sign of regression. Instead, I consider that the distinguishing rate is caused by control and deception. Let me back this up. Sort the above matrix by the 5th or 6th column: zone% or its z-score. Marcus Stroman ranked 27th overall for starters with more than 90 innings pitched. Look at the 3rd column: swing%. There are only four pitchers ahead of a Stroman (highlighted in gray) who prevented swings at a better rate yet had an elite zone%: Jesse Chavez, Shelby Miller, Jon Niese and Hector Santiago. All five of these guys including Stroman have bad swinging-strike rates. Only Jesse Chavez had a better swinging-strike rate, but Stroman has an extra pitch (Slider, which induces a ton of grounders), more velocity, and release point consistency. 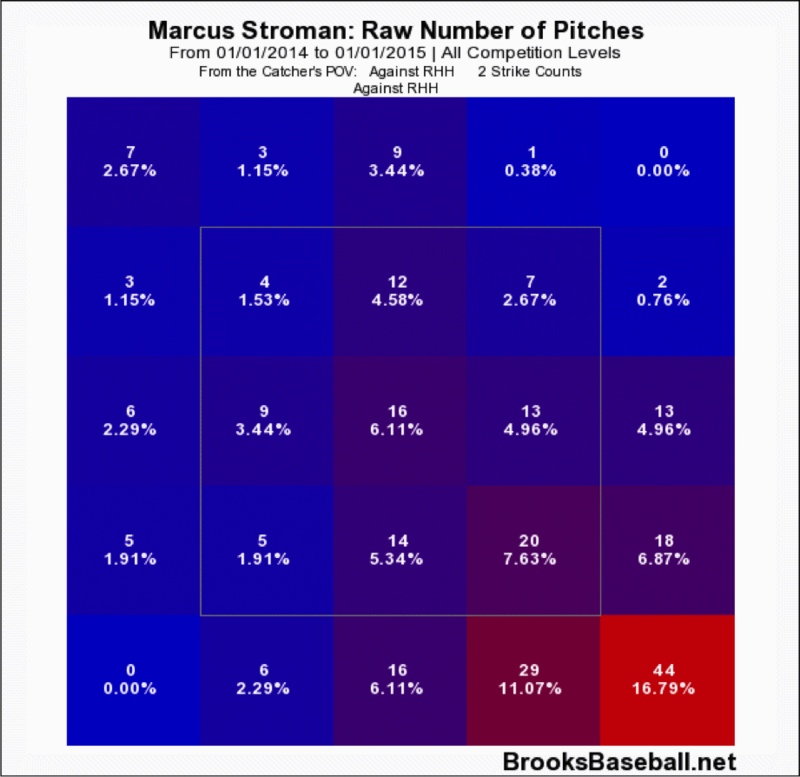 Unlike the other four, Marcus Stroman had excellent release point consistency: 32nd overall (FanGraphs+ is required) with a mean, within-game 1.44 RMSE. Stroman was also extremely consistent game-to-game landing just ahead of Corey Kluber and Jordan Zimmermann at 8th overall. Stroman’s release point consistency was very important to his contact/swinging-strike rates last year. If you sort the last column in the embedded leaderboard (within the release point consistency post), you will see that his RMSE/release point consistency score had the strongest expected relationship meaning the more consistent he was, the better his outcomes. His contact rate had a .73 correlation to his RMSE. The effect was apparent on his ERA, xFIP and SIERA as well. I just took a gander at RotoGraphs 2015 Top 300 Rankings, and assuming Jeff Zimmerman ranks Stroman around where I have him (which he did in his SP rankings), Stroman should land in top 110 territory. I personally have him ranked 98th overall. I have his z-sum (5×5 value i.e. relative to all other pitchers) ranked 79th overall. I have his position-adjusted value ranked 121st overall. Early #MockDraftArmy results associated a 152.2 draft position for him (somewhere in the middle of the 12th round for 12 teams league), which was perfect since I’m targeting him in rounds 10-12 depending on who else is available. For my personal rankings, I average these results (79, 121 and 152.2) with a more significant weight on the z-sum (actual fantasy value despite position adjustments and average draft position). This gets me to 98th overall. 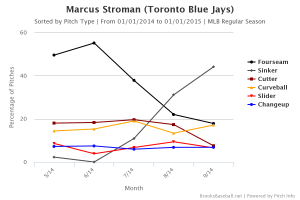 If I miss out on starters early, I’ll reach on Stroman (rounds 8-10) relative to his ADP. If he was pitching in the NL East, I think we have another Jordan Zimmermann on our hands — whose eerily similar to Stroman from an arsenal score (one spot or .01 ahead) and a release point consistency perspective (Zimmerman’s RMSE = 1.34/18th overall vs. Stroman’s RMSE at 1.44/32nd overall). Expect Zimmermann’s 2012 minus the NL East beneficial ERA-SIERA differential. 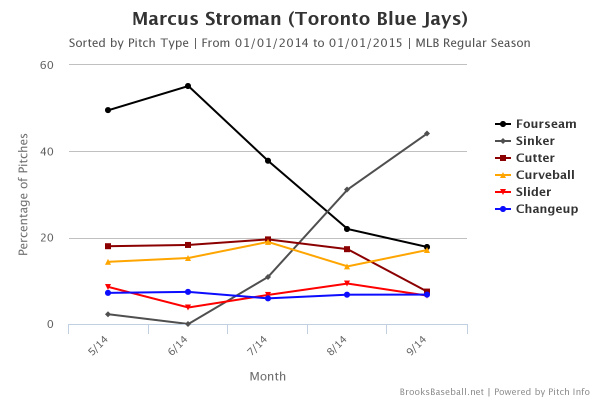 In fact, Stroman’s expected ERA’s (3.175) was almost 50 points under his actual, surface ERA. If Stroman had an elite defense behind him and/or was in a more pitching friendly environment, I would think of him as a top-15 starter. He induces a ton of grounders, which should ground his BABIP and left-on-base%. Without any hesitation, I’ll draft a bat in place of Jordan Zimmermann and take Stroman 50-75 picks later. That’s 4-7 rounds! We hoped you liked reading Marcus Stroman: Your AL East Jordan Zimmermann by Daniel Schwartz! I am trying to come up with different ways to evaluate value, positional adjustment and ADP and this is a really creative way to do so. Is this something you have been doing for several years and if so do you find it beneficial in terms of grabbing players at good value without reaching too far? ive been doing it for some time for my own personal rankings and not when i post content. i went =(79+79+121+152.2)/4, but then ranked all players by this and Stroman wound up at 98th overall. i like this approach because it values the position, adp and actual relative value despite everything.